For thousands of years emperors, clerics, nobles and kings all over the world have erected slabs of stone called stelae as markers to indicate a boundary, either phsyical or temporal. They commemorate battles won, loved ones lost, borders, holocausts, and laws. Some stelae have been vital sources of information on past societies; many still stand after millenia. Outside the Everhart Museum in Scranton, four ceramic stelae have been erected by an artist named Jordan Taylor. 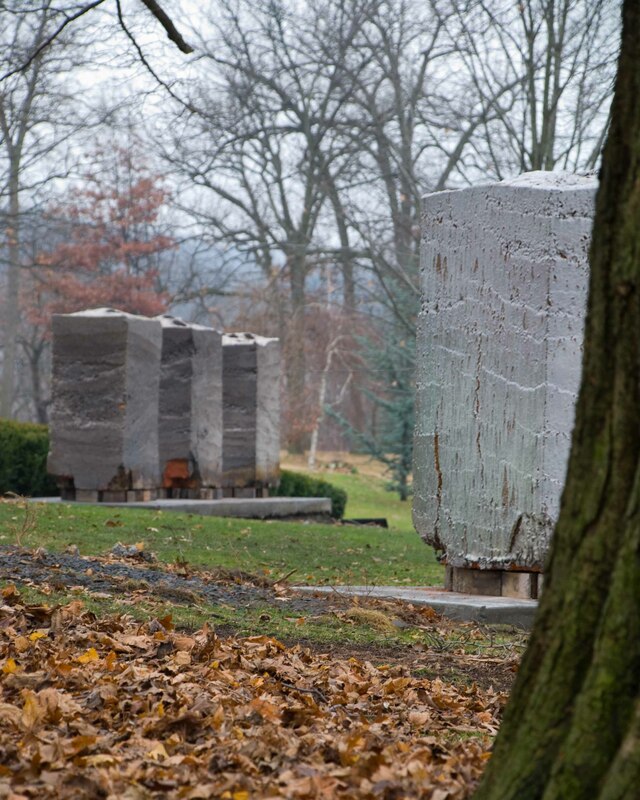 The four-ton blocks will sit in Nay Aug Park, marking the entrance to the museum, until they erode “and follow the watershed as far as the Chesapeake Bay, back to the lie of the land”. Rather than a king’s accomplishment or a claimed territory, they mark the absence of boundary, the dissolution of moment and material into matter and spacetime.